Friday, August 12, 2005, 7:30 p.m.
“Broken Song” written by Morgan Ho, directed by Takeshi Kaji and Victoria Wong. May Chau finally clarifies her questionable past to her prying daughter. “Not the Last Samurai” written by Benjamin Piiru, directed by Amy Chow. A time-traveling samurai, a romantic thug, and a good evil doctor Ethis play has it all! Except for maybe a plotline…or does it? “Coming Full Circle” written by Benjamin Piiru, directed by Melissa He. Understand the struggles of a boyfriend caught in an abusive relationship. “Family Establishment” written by Lauren Yee, directed by Timothy Cheng. Pei Pei explores the pain and life of being a Chinese immigrant. “That Not-So-Asian Feeling” written by Diann Leo and Michael Leo, directed by Diann Leo. Two sisters reflect on a clerk’s misunderstanding. “Love, Asian-American Style” written by Zachary Zwillinger, directed by Benjamin Piiru. Watch love as it becomes a fickle and nauseating roller coaster ride. 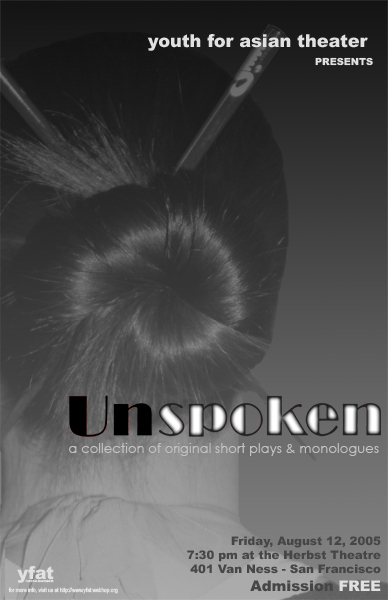 Featured monologues written by Laura Fong, Katherine Mar, Elisa Yeung, and Tracy Zhu. Youth for Asian Theater is a student-run organization that raises awareness around cultural identity and youth issues through the performance arts. Now in its fifth year, YFAT operates entirely through the efforts of its cast and crew members as they bring the script and stage together. Company also includes: Samantha Eng, Brianna Lee, Sel Lee, Sherwin Li, Tony Liao, Lisa Lin, Jean Long, Aaron Louie, Katherine Mar, Rebecca Morita-Hidalgo, Sunshine Roque, Arthur Shi, Stella Tan, Kathy Tom, David Tran, Evelina Vu, Crystle Wong.